Momentum continues with the third-generation Chevy Equinox. 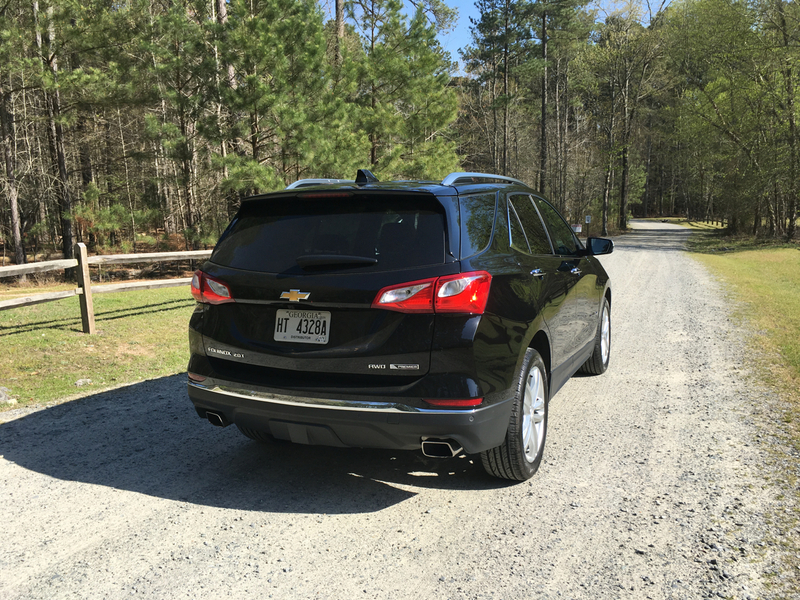 This third-generation Chevy Equinox is smaller and lighter than before. How do you make an already competitive product better? By carefully starting anew, particularly through a clean sheet design, but without forgetting what made the product appealing in the first place. 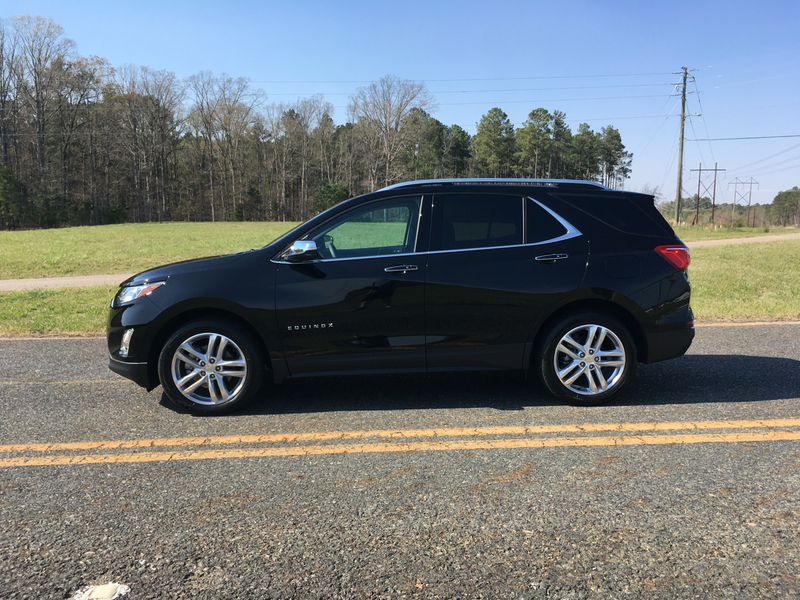 That’s exactly what Chevrolet has done with the 2018 Equinox, an all-new compact SUV that launches this model’s third generation. What’s especially noticeable about the new model is that it is smaller and lighter than the one it replaces, taking an unconventional approach for the segment. The move makes sense as previous models were at the top-end of the compact SUV in sizing. The latest Equinox shed up to 400 pounds, clearly enabling it to battle the industry leaders — Toyota RAV4, Nissan Rogue, Honda CR-V and Ford Escape — with a fresh product. Chevrolet offers the 2018 Equinox in L ($24,575), LS ($28,295), LT ($29,545) and Premier ($35,495) trims. Among the last two trims are three subcategories based on each of the engines offered. Yes, Chevrolet offers three engine choices, taking the same approach as Ford. On the other hand, the top three segment sellers offer just one engine. We’ll examine the engine choices in detail later, but there is something wholly unique to the Equinox that none of its competitors can claim: an available turbo-diesel engine. The diesel joins a pair of turbo gas engines. Gone are the previous four- and six-cylinder engines from the product line. The all-new Chevrolet Equinox comes in four trims. Shorter and lighter than the previous model is a trend we aren’t seeing all that much in the auto industry. In some cases, manufacturers are building larger vehicles and shaving pounds in the process. Credit must go to various lightweighting efforts, including greater use of aluminum, carbon fiber, composites and even special steels to save weight. The look of the 2018 Equinox is thoroughly modern, even sporty. Chiseled edges, deep sculpting, unusual character lines and a flowing roofline give this SUV its look. The front fascia offers a curved grille with upswept headlamps and a narrow lower grille opening. Along the sides the beltline pushes up; the roof pillar behind the second-row seat is thicker than it has to be. From the rear, you’ll find stylish wraparound tail lamps with available dual exhaust finishers. Base models come with 17-inch aluminum wheels; 18- and 19-inch wheel choices are also available. Automatic headlamps, heated power-adjustable side mirrors and a manual liftgate come standard. Optional features include LED lights, front fog lamps, a roof rack, a power sunroof and a power liftgate. Despite its slightly smaller size, the Equinox’s cabin seems nearly as roomy as before. Four can sit in comfort, five in a pinch. Cloth seats are standard; leather seats are available on the Premier trim only. 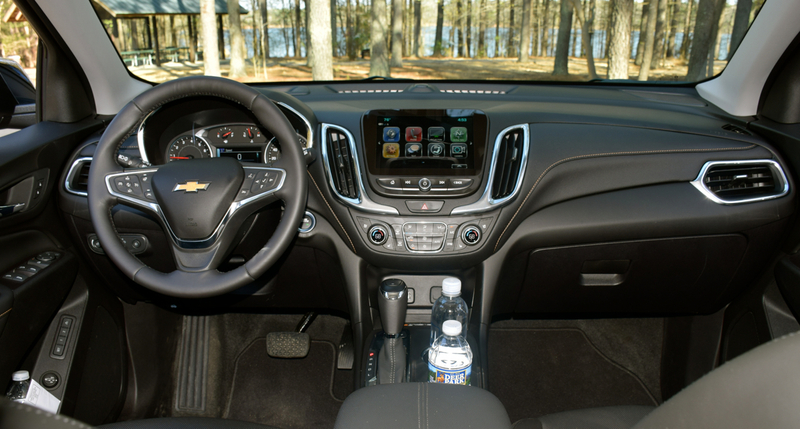 The Chevy Equinox offers a clean and uncluttered layout with handsome flowing lines across the dashboard. Base models have more plastic than we like. The tested Premier trim covers most surfaces with leather, including door inlays. The standard cargo space measures nearly 30 cubic feet and slightly more than double that with the rear seat folded. Still, the available space is just average for this segment. Standard equipment includes full power accessories, a tilt-and-telescopic steering column, air conditioning, front bucket seats and a split-folding rear seat. Upgrades include power front seats, heated front seats, heated outboard rear seats, dual-zone climate control, a heated steering wheel, and a cargo liner with a cargo cover. Choose your engines! 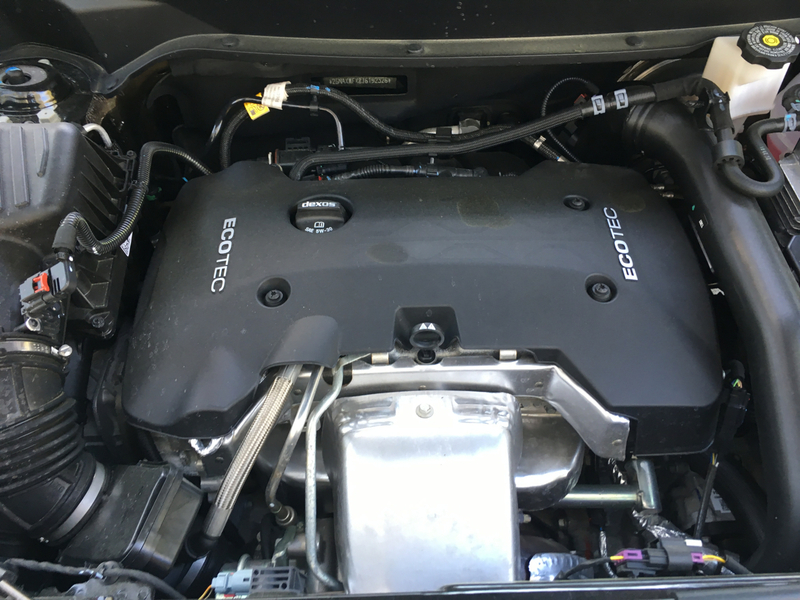 Yes, you do get a choice of three engines with the 2018 Equinox, including the segment’s only diesel. Gone are the 2.4-liter four-cylinder and 3.6-liter V6 engines, replaced by turbocharged 1.5- and 2.0-liter four-cylinder gas engines. A 1.6-liter turbo-diesel four-cylinder engine rounds out the product line. The base engine makes 170 horsepower and 203 pound-feet of torque. Power is sent to either the front or all four wheels by means of a six-speed automatic transmission. The larger of two gas engines displaces at 2.0 liters and makes 252 horsepower and 260 pound-feet of torque. Chevrolet pairs this engine with a nine-speed automatic transmission. If you want a turbo-diesel, then the 1.6-liter TDI four-cylinder is your option. This engine makes 137 horsepower and 240 pound-feet of torque, and comes paired with a six-speed automatic transmission. Why does Chevrolet even offer a diesel in this segment? Apparently, they see sufficient demand, once met only by Volkswagen and now open for the taking as VW has exited the market. The top-trim Premier supplies leather covering most surfaces. Stellar fuel economy for the segment. What’s important with how Chevrolet packaged this engine is that it costs less than the 2.0-liter (even though we list it as Engine No. 3). It also delivers an EPA-estimated 39 mpg compared with 32 mpg for the standard engine and 29 mpg for the larger gas engine. Allow those numbers to sink in for a moment. My test Premier came with the 2.0-liter turbocharged four-cylinder engine along with all-wheel drive. It replaces the naturally 3.6-liter V6 that had long paced this model, thus there is some drop off in power. Happily, its overall performance is nearly the same thanks to a smooth and quick shifting nine-speed automatic transmission and reduced overall weight. That doesn’t mean you won’t notice the turbo lag — it is present and sometimes an annoyance. More annoying is the stop/start technology that automatically shuts down the engine with no override button available. I got to the point where I allowed the system to kick in while the SUV was stopped, but then released the brake just enough to cause the engine to restart. Sorry (not sorry), I just don’t like the interference. 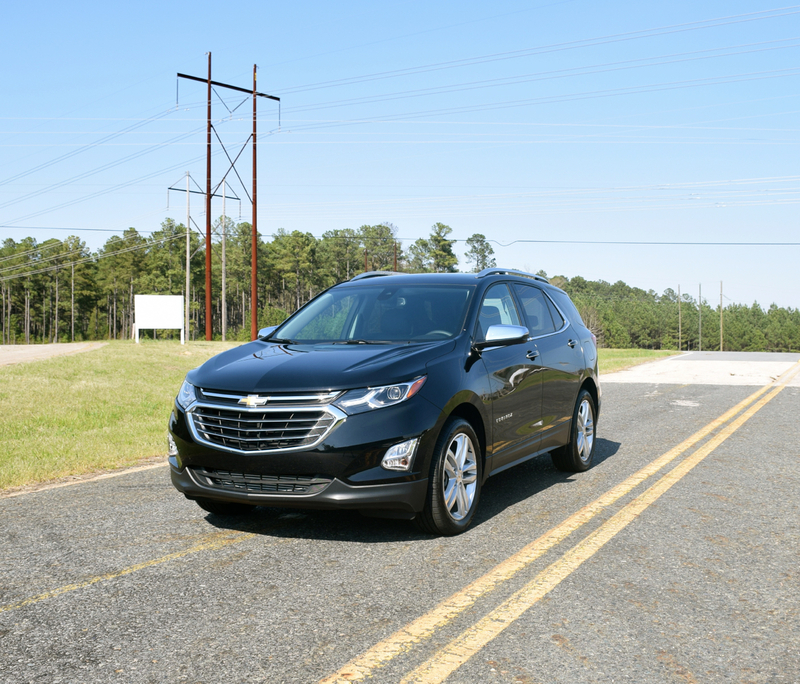 The Equinox’s electric power steering is lightly weighted and handling is average at best. You’ll experience body roll as you make your turns, something the larger 19-inch wheels set within performance all-season tires should limit. Unfortunately, we cannot comment on either the base engine or the new diesel. Word has it that the standard engine is up to the task. As for the diesel, we like that it produces nearly 40 mpg. We also like that it isn’t the most expensive engine available. We’ll be following the take rates closely on each engine. There are three turbo engine choices with the Equinox including a diesel. Most 2018 Equinoxes come with a six-speaker audio system, Bluetooth, Apple CarPlay and Android Auto smartphone compatibility, a USB port and an auxiliary input jack. Satellite radio, a seven-inch color screen, OnStar 4G LTE and an OnStar guidance plan are also included. Options and upgrades include a Wi-Fi hotspot, additional USB ports, a 115-volt power outlet and HD Radio. Also available is a seven-speaker audio system, navigation and a rear entertainment system. Our experience with GM’s touch-screen system has generally been very positive. The app-like interface is easy to understand and directions are served accurately. That said, we prefer Apple CarPlay to supply directions, something Android Auto users may also find helpful. On the safety front, all models have a rearview camera. Our main beef with Chevrolet’s safety packages is that they’re not available with the base trims. These features include lane change alert with side blind zone alert, lane keep assist with lane departure warning and low speed forward automatic braking. Oddly, Chevrolet doesn’t offer adaptive cruise control. Each of these features are now standard or available on competing Toyota products. with 30 cubic feet of storage space. Chevrolet’s best-selling model after its very popular Silverado is the Equinox. We’re not surprised as this category of SUVs is the strongest one out there. That said, you have to deliver a product customers want and once again Chevrolet largely succeeds. Prices can climb fairly quickly, approaching $40,000 for fully loaded models. The good news is that if you really want a diesel it is available on the two top trims. We priced out a front-wheel drive LT model with the diesel for $31,695. 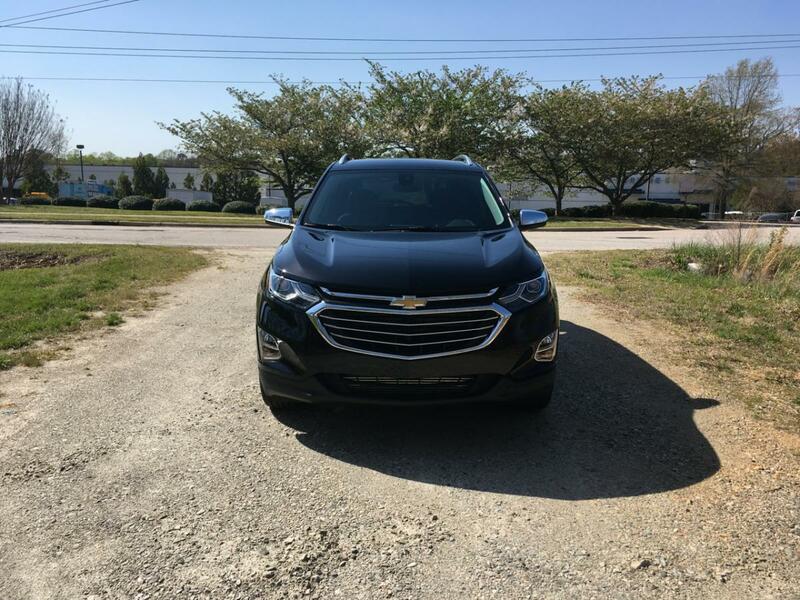 We think at least 10 percent of Chevy Equinox shoppers will opt for one, as they enjoy the stellar fuel efficiency, simplified maintenance and longevity that such an engine affords. 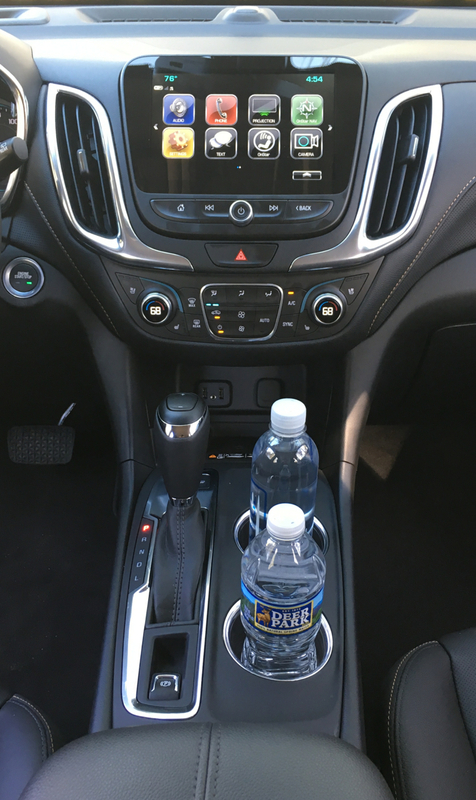 All in all, the 2018 Chevy Equinox does what it has to do. With sales up nearly by one-third for the first three months of the year, customers apparently agree. Even edging out the Honda CR-V for third place is a big deal and suggests that the third-generation Equinox has what it takes to win.